Peace Sign Atop “Peace Rock” Disappears From Sunset Cliffs – Vandals? Thieves? Conservatives? 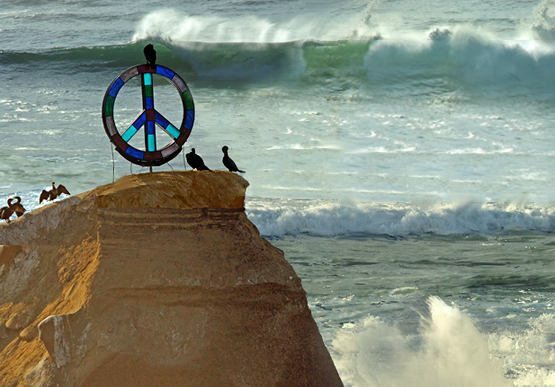 OCEAN BEACH – Sadly community members are discovering that someone has taken the peace sign from “Peace Rock” off Sunset Cliffs. Some time over the last couple of days, the widely-known and loved art installation project disappeared. Those responsible for placing the universally-recognized peace sign, made of stain glass, on top of the solidarity rock have today acknowledged via their web site that they do not know of the signs whereabouts. In a statement to the community, they urge whoever took it, return it via an alley behind an artists’ coop on Newport Avenue, Rock, Paper, Scissors. See more of what they said at Peace Rock here. Oh no! Talk about OB Landmarks, and places that tend to represent the vibe of the area. I jog past the Peace Rock almost every day, and will miss it. We had already planned on using a picture of it in our Holiday Greeting Card next year. I hope the sign will be recovered and returned, and at the very least displayed in some local gallery or business. When we find the thieves, let’s have them spend a night on the rock, lashed by ropes, fed by seagulls. Sorry, just had to say that. How unfortunate. I hope the symbol gets returned soon. The odious object should have been removed! This peace symbol was an outrageous insult to the brave American warriors and heroes who are risking their lives and bringing peace and democracy to the Middle East. Once we Americans clean the world of all the anti-democratic riff-raff and terrorists who hate our way of life, then we will be abler to build a true peace monument as a testimonyt to our altruism and good intentions. In all seriousness, those who removed it probably believed “all of the above ” nonsense. Clever take there Richard. I hope they find the symbol of peace and restore it to the rock. Or we in OB will just have to build another one. Someone should start an OB fund raising campaign to restore the peace symbol. It would be a good example of community power, a statement to the militaristic neanderthal gonad bipeds who removed it that the people of OB support peace over war. Restore the OB peace symbol now! I’m sorry to hear that the symbol was taken. I posted a big ‘peace’ sign on the I-8 just before New Years and just got a comment from a detractor who claims to have torn it down. I am moving away from Ocean Beach and The Peace Sign is the only picture that I wanted for memorabilia. It is the break for the first wave I rode. We need to get this symbol back. It stood as a pacifist warning to the brutal murderers wearing the uniforms of the United States. Dave ! Great to hear from ya, dude. We’ve missed your comments as you were one of the Great Commentators on this site. We’ve been trying to stay in touch with you around this library issue. I have a friend who works with a local SD magazine. They are looking to do a short story on the rock…and the peace sign. Please contact jim at jgsdpw13@hotmail.com. Phil – Another one has since been mounted on the top of the OB Hostel on Newport Ave. Installing the Peace Sign in the middle of the night, and then watching the (generally) positive reaction of the community to it for over a year and a half, was one of the greatest thrills of my life. For ME — and I think for many — it could have stayed there forever and been a wonderful symbol of our community. And when it was stolen, I was devastated and sad, but I came to believe that we should never have presumed to own that rock forever, and so it probably had to go sometime. Now, I am so proud every time I walk down Newport Ave of the beautiful sign we put atop the International Hostel, how beautiful it looks on a sunny day framed perfectly between the palm trees, and how it is a lighted beacon of peace every night. O.B. is a unique and wonderful community, and while there are some among us who would steal peace signs, there are MANY among us who really BELIEVE in everything that symbol represent. Think Peace! Think Love! Believe! I would LOVE to have a new peace sign on the rock . . . forever, but alas I am concerned that, just as the last one was dismantled and stolen, this one would be too (and it was a very expensive, original stained-glass piece of art). The only installation on the rock since then — something for the PLHS class of 2010 or something — was also dismantled within a day or two . . . making me think there is a “rock vigilante” out there who has decided that it is not proper for anyone to use that public space for private artistic expression. Anyway, I take great pride in the beautiful 6 foot sign we installed a few years ago atop the International Hostel on Newport Avenue, and that lights Ocean Beach every night. I encourage you or anyone else to pursue any worthy ideas for the rock. It has been a strong local tradition for decades, and I would hate to see it die. I dig the idea of putting something new up, and possibly changing it every season like I think I remember. Spring (Peace), Summer/Fall (Surfer), Winter (Xmas Tree). I can also possibly help in finding a was to “secure” whatever does go up. Well, if the OBCDC can put a war memorial in the public right away in front of the ocean surely a rock owned by no one can have a peace sign. To top it off….a drown will be mounted on top of the rock to see who dares remove it yeeeeaah! Ha! And good point on the War Memorial. I HAVE considered how the next person who does any installation should definitely install a GPS tracking device and maybe a motion sensor to send an alert if the installation was ever tampered with. I can be reached through HERE, I suppose, and if anyone wants INTEL on how to make some new installation a reality, I would gladly help. How about a compromise on a peace memorial in OB proper? OB was the main town in all of San Diego that was visibly anti-war and for peace for 2 wars: the Vietnam war and the Iraq war under Bush younger. Obviously I’d support a peace memorial of any type in Ocean Beach . . . not as a “compromise” of anything, but just because if anyone (Frank?) has an idea for what or where or how on that, I’m saying GO FOR IT. As for stained-glass peace signs, I’m still digging the beautiful one that reigns the Hostel and lights up Newport Avenue every night. And as for THE ROCK, I still hope someone with a good idea — any good and deserving idea — makes a GO for it.